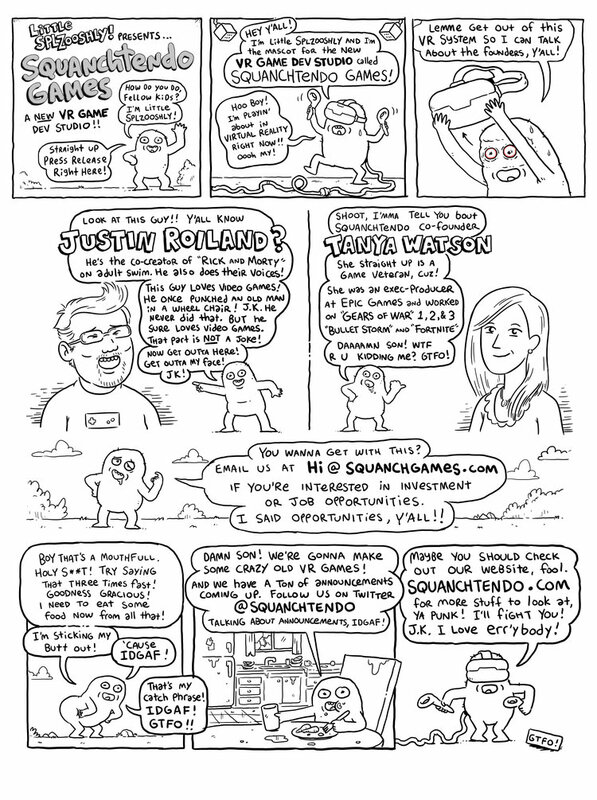 Squanchtendo Games is everything you'd expect from Justin Roiland. Most folks know Justin Roiland as the co-creator and lead voice actor behind Adult Swim's Rick and Morty, but it's less widely known that he's obsessed with virtual reality. The entertainer was one of the first backers of Oculus' original Kickstarter, and has reportedly filled notebooks with game ideas and concepts. Now, he's is going all in on his obsession: today, in partnership with former Epic Games executive producer Tanya Watson, Roiland announced Squanchtendo Games. It's a VR game studio with, in Roiland's words, one simple goal: "We just want to make super duper games dooood." Roiland is new to the world of gaming, but he's not exactly a novice. He's already helped Adult Swim make one Rick and Morty game, and has been working on another with Owlchemy Labs -- a VR Rick and Morty simulator called Virtual Rick-ality. His role seems to be more focused on design than programming and production, but that's where Watson comes in. At Epic Games, she helped make three Gears of War titles, Fortnite and Bulletstorm. Not bad at all. The new company hasn't yet announced any games in production, but Roiland certainly has ideas. In 2005, the creator told PCGamer that he'd filled three notebooks with VR game idea, said he's trying to figure out how to allow players to talk to virtual reality NPCs in a way that feels natural and unrestrictive. For now, though, Squanchtendo Games is mostly just looking for staff to help them build their first title. The company's website (and hilarious hand-drawn press release) focuses almost exclusively on finding artists, designers, producers and programmers to help them build great VR experiences. Not a game designer? Check it out anyway -- the entire website is saturated in Roiland's brand of oddball humor, and likely serves as a good preview for the kind of games we can expect from Squanchtendo in the future.